filosofi kopi - History of Coffee, History records the coffee plant originating from the Abyssinia, 4 names of the old regions of Africa that currently cover the territory of Ethiopia and Eritrea. Little is known of how the Abyssinians used the coffee plant. Various historical references say coffee is popularized as a refreshment drink by the Arabs. Coffee beans became a commercial commodity after being brought by Arab traders to Yemen. In the early days, the Arabs monopolized the trading of coffee beans. They control the trade through Mocha, a port city located in Yemen. At that time Mocha became the only trade gate of coffee beans trade. Thus the port is strategic in coffee trade, to the extent that the Europeans call the coffee with the name Mocha. Entering the 17th century the Europeans began to develop their own coffee plantations. Because the European climate is not suitable for coffee plants, they cultivate these plants in their colonies scattered in various corners of the earth. One of them in Java developed by the Dutch. For a certain period of coffee from Java had dominated the world coffee market. At that time a cup of coffee more popularly known as "Cup of Java", literally meaning "cup of Java". Before further tracing the history of coffee it's good we start with the origin of the word "coffee" itself. According to Wiliam H. Ukers in his book All About Coffe (1922) the word "coffee" began to enter into European languages around the 1600s. The word is adapted from the Arabic "qahwa". Or, perhaps not directly from the Arabic term but through the Turkish term "kahveh". In Arabic the term "qahwa" is not intended for the name of the plant but refers to the name of the drink. In fact there are some notes that mention the term originally referring to one type of drink from wine (wine). But experts believe the word "qahwa" is used to refer to drinks made from seeds brewed with hot water. The seeds are known to come from fruit produced by coffee plants. Still according to Ukers, the origin of the word "coffee" is scientifically discussed in the Symposium on The Etymology of The Word Coffee in 1909. In this symposium in general the word "coffee" is believed to refer to the term in Arabic "qahwa", which contains meaning "strong". There are also those who deny the term coffee is taken from Arabic. According to them the term coffee comes from the language where the coffee plant originated the Abyssinia. Adapted from the word "kaffa" the name of a city in the Shoa area, in the South West of Abissynia. But this assumption is refuted because it is not supported by strong evidence. Other evidence shows in the city the coffee fruit is called by another name ie "bun". In Arabic records "bun" or "bunn" is used to refer to coffee beans instead of drinks. From the Arabic the term "qahwa" is adapted into other languages such as the Turkish "kahve", the Dutch "koffie", the French "café", the Italian "caffè", the English "coffee", the Chinese "kia-fey ", Japanese" kehi ", and Malay language" kawa ". In fact, almost every term for coffee in different languages has the same sound with the Arabic term. Especially for the case of Indonesia, most likely the word "coffee" is adapted from the Arabic term through the Dutch "koffie". Allegations are logical because the Dutch first opened coffee plantations in Indonesia. But did not rule out the word is adapted directly from Arabic or Turkish. Given the many parties in Indonesia who have relations with the Arabs before the Europeans came. Anyone who tries to trace the origins of coffee may find two very famous legends. 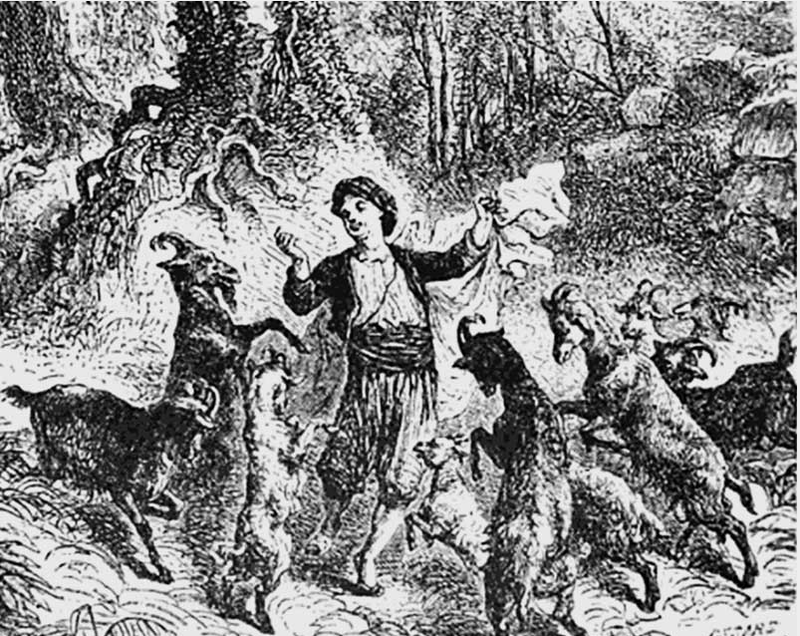 The story is "Si Kaldi and goat" and the story of "Ali bin Omar al Shadhili". Both of these legends tell the early humans to process the coffee fruit. The story is taken from a growing legend in Ethiopia. Shah and there is a goat owner named Kaldi. One day the Kaldi found his goats hyperactive, jumping to and fro like dancing. After investigation, the goat has been eating red berries from unidentified trees. Curiously the Kaldi tried the fruit. After eating it he found himself behaving like a goat. It is said that in the city of Mocha, Yemen, lived a physician as well as a devout devotee of worship, his name is Ali bin Omar al Shadhili. Omar is famous as a reliable healer who can cure illnesses by combining medical and prayer actions. But the lunge of Omar is not favored by local rulers. With a variety of intrigues Omar rumored to ally with the devil to heal his patients. Finally the people of Mocha drove Omar out of town. After being driven from the city, Omar took refuge in a cave he found on the way. He began to starve and find red berries. Omar ate the fruit to ward off his hunger. Because it tastes bitter, he began to process the fruit by baking and boiling it. But Omar's processed beans remain inedible. He can only drink water. Unexpectedly the water he drinks gives extra strength. Long story short, water steep made Omar start famous. Many people have asked Omar. Until the phenomenon sounded the city ruler. Then Omar was called back to live in the city. The elixir of black liquid is called Mocha. Almost all literature on coffee history approves the origin of coffee plants from Abyssinia, an area of Africa that once existed under the Ethiopian Empire. Today it covers the territories of Ethiopia and Eritrea. In the early days of all cultivated coffee plants is a type of arabica coffee (Coffea arabica). From Abyssinia coffee plants are brought and cultivated in Yemen. It is estimated that the coffee plant began cultivated in Yemen in 575 AD. At this time the development of coffee cultivation is slow. Coffee beans are only traded out of Arabia through the port of Mocha in Yemen. Arab traders try to protect the exclusivity by requiring the boiling of coffee beans to be traded. With the hope that coffee beans can not be grown into plants. Attempts to isolate coffee beans by Arab traders did not work. In 1616 the Dutch managed to bring the coffee plant from the port of Mocha to Holand, the Netherlands. In 1658 the Dutch began trying to cultivate coffee crops in Sri Lanka. No reports of cultivation of this plant reaped great success. Known also the Europeans have tried to cultivate coffee plants in Dijon, France. But this effort failed miserably, coffee can not grow on European soil. In addition to passing the harbor turns many other entrances that allow traffic trading coffee beans. One of them through the journey of pilgrims who want to pilgrimage to Mecca and Medina. In 1695 Baba Budan, a pilgrim from India, managed to bring productive coffee beans out of Arabia. He cultivated a coffee plant in Chikmagalur, southern India. In 1969 the Dutch brought coffee from Malabar, India, to the island of Java. The coffee plant comes from the beans that are brought from Yemen to Malabar. The coffee plant was planted in Kadawung, but this effort failed due to flooding. Coffee is brought to America and the surrounding islands by two doors. Beginning in 1706 when the Dutch brought coffee plants from Java to the botanical gardens in Amsterdam. From Amsterdam the coffee plant is brought to Suriname. Others were given as gifts to King Louis XIV in Paris. In 1720 a coffee plant from Paris was brought to be planted in a French colony in the Caribbean Islands. The story of coffee plant travel is very popular. Told a coffee tree that was brought with the French ship could remain alive because watered with drinking water belonging to the officer carrier. All the coffee plants from the source in Amsterdam are known as Typica cultivars. Another way the coffee plant goes to America via Bourbon Island, now La Reunion. The plant comes from seeds given by the Sultan of Yemen's envoy to King Louis XIV in the year 1715. France received 60 grains of coffee seed on Bourbon. Then this seed spread to French colonies in America and other regions. This coffee plant is known as the Bourbon cultivar. Both arabica coffee cultivars, namely Typica and Bourbon are believed to be the source of coffee plants that are currently being developed in various plantations. The oldest written document about coffee is found in the records of Al Razi (850-922) a Muslim scientist who is also a medical expert. He calls a drink that has a coffee-like character with a bunshum. This note is reinforced by a medical expert thereafter, Ibn Sina (980-1037), who describes a seed that can be brewed and efficacious cure one of the stomach ailments. All the information given by Ibn Sina refers to the characteristics of coffee that we know today. He called the drink bunshum and seeds with the name of bun. Coffee becomes an important economic commodity in the Islamic world. The coffee drink is very popular among pilgrims in the city of Mecca, although it has been declared a prohibited drink several times. Pilgrims drink coffee to stay awake when worshiping at night. The popularity of coffee was widespread in the days of the Ottoman Empire. In telling coffee drinks become the main dish at every celebration in Istanbul. At this time also coffee began to be favored by Europeans. In the early 1600s the merchants in Venice bought coffee from the port of Mocha in Yemen. From this place spread to other European regions. Then in 1668 the coffee began to cross the Atlantic Ocean and arrived in New York, when it was still a Dutch kooni. Based on International Coffee Organization (ICO) records, there are 4 types of coffee traded globally namely arabica coffee, robusta coffee, coffee liberica and coffee excelsa.7 The four types of coffee comes from 3 species of coffee plants. Arabica is produced by the Coffea arabica plant. Robusta produced Coffea canephora plant. While liberica and excelsa are produced by Coffea liberica plant, exactly Coffea liberica var. Liberica for liberica coffee and Coffea liberica var. Dewevrei for excelsa coffee. In the early days coffee was only known in Islamic societies in the Arabian peninsula. In the early 17th century coffee began to be traded out of Arabia via the port of Mocha in Yemen. Arab traders have monopolized this commodity for a long time. Beginning in the 18th century, Europeans began to produce coffee outside Arabia. Until in 1720 the Dutch shifted Yemen as world coffee exporter. Dutch products obtained from coffee plantations in Java and the surrounding islands, currently Indonesia. Indonesia became the world's largest coffee producer for almost a century. In 1830 the position of Indonesia as the largest coffee producer shifted Brazil. Until now, Brazil is the world's largest coffee producer. Today coffee is grown in more than 50 countries in the world. Brazil, Vietnam, Colombia, Indonesia and Ethiopia are the largest coffee-producing countries. Brazil is the dominant coffee producer. The amount of coffee coffee produces about one-third of the world's total coffee production. By 2015 Brazil produces about 2.5 million tons of coffee beans. Coffee production in Brazil is dominated by arabica about 80%, the rest is robusta. Arabica coffee is considered better and appreciated higher than other types of coffee. Meanwhile, in 2015 Indonesia occupies the position of the four coffee-producing countries. According to the Indonesian Coffee Exporters Association (GAEKI), about 83% of Indonesia's coffee production is from robusta and 17% arabica.8 Indonesia also produces copies of liberal and excelsa types but is insignificant compared to arabica and robusta.